Best Events In Vancouver | An invitation to create positive change by participating in local, affordable, and sustainable community building events. You are invited to trade in clothing that no longer inspires you, in return for new to you items to revamp your eco-conscious wardrobe. A sustainable way to encourage an exchange of treasures while connecting with community. Clothing swap events provide great opportunity to make space and clear out your closets. Please bring your quality, gently worn items to give away, and find what you didn’t know you were looking for! Let’s make this swap awesome! ☆Attendees are invited to bring at least five good quality items. ☆Your contributions will then be sorted and added to everyone’s contributions for an opportunity to select of new to you items. ☆When you arrive, welcome! Event admission must be paid prior to swapping. Please drop off your clothing contributions, and then you are welcome to drop in anytime between 5-7pm to get your swap on. ☆This is an all ages event. Volunteers and kids under 12 get into the event at no charge. ☆Interested volunteers must arrange their opportunities prior to the event. ☆Bring your own reusable bag to take your new items home. ☆Leave your own personal items (water bottles, purses, jackets) close and safe where they will not be mistaken for swappable items. ☆Mingle with friends, and connect with other clothing swap participants, while checking out all the selection of items to be swapped. You are welcome to help yourself to a selection of what you like best. ☆Afterwards you are welcome to bring your items home to wash in warm and dry, then enjoy! ☆Please help spread the word, the more the merrier, with more selection to choose from. Clothing swaps contribute to sharing resources in an enviro-friendly way. Let’s work together to create yet another great community building event. Good vibes only please! Like to look great? 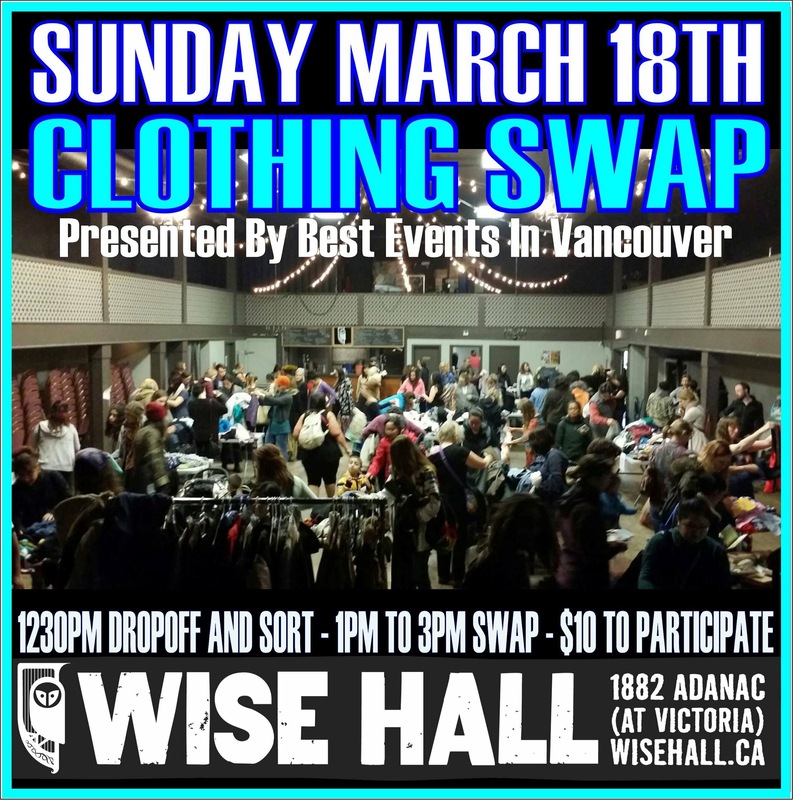 You are welcome to join us for an upcoming clothing swap offered tomorrow/Sunday, March 18th! Unload clothing that no longer fits, pick up a few items that make the family look slick. All leftovers donated to charity, keep stuff out of landfills, and connect with your community while doing it all. "A comprehensive list of July events in Vancouver for 2017. Highlights include: The fireworks, outdoor movies, wiener dog racing, Adult Night at the PNE, Taco Fest, Khatsahlano, and a whole lot more!" Our vision is for Vancouver to be a zero waste community by 2040. Share, reuse, and refurbish products and materials before recycling them"